N R Narayana Murthy, co-founder and chief mentor of IT major Infosys Technology, said corporate bodies in developing countries like India have a responsibility to involve themselves in philanthropic acts to help underprivileged people. 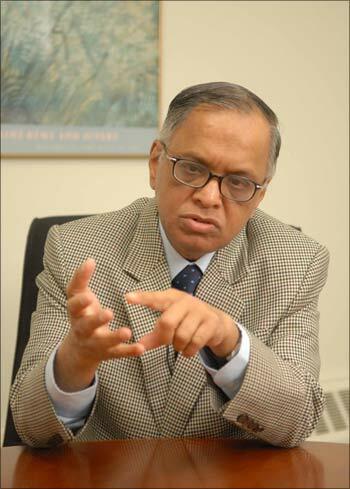 In an interview with rediff.com on the sidelines of the American India Foundation Annual Summit in New York on Monday, Murthy said that developing countries need philanthropy more than developed nations for very simple reasons: there are lots of poor people and the government cannot do too much because of its limited resources. "So it becomes the responsibility of the civil society and the corporations to add value to the efforts of the government in making sure that the society becomes better, be it through educational initiatives, healthcare initiatives or nutritional initiatives," Murthy said. 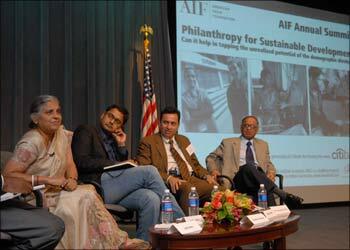 Image: (From Left): Sudha Murthy, chairperson Infosys Foundation; Salil Shetty, Director, UN Millenium Development Campaign; Reuben Abraham, professor and executive director, Center For Emerging Market Solutions, India School of Business; and N R Narayana Murthy, chairman and chief mentor Infosys at AIF Annual Summit in New York on Monday. He said in the brief interview that the reasons why corporate entities should take part in philanthropy are that they have to earn the goodwill of the society that contributes customers, employees and investors. "The society produces politicians and bureaucrats who frame the policies for the businesses. So unless businesses live in harmony with society, unless businesses earn the goodwill of the society, they will not be able to succeed on a sustainable basis. That is why philanthropy is very important in every society, but more so in developing society such as India," he said. Asked if the idea of corporate responsibility that is a buzzword these days has taken root in India where there are many large corporations, Murthy said that the Tatas have been doing it for over 100 years and the Birlas have been doing it as well for some time and that there are many business families who have been doing it. 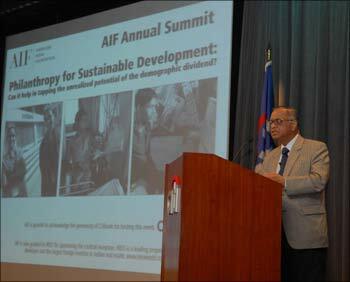 Image: N R Narayana Murthy, chairman and chief mentor Infosys, speaking at the AIF Annual Summit in New York on Monday. "But now the awareness has become widespread, simply because corporations have realized that unless you have earned the goodwill of the society, you cannot sustain your growth (and) you cannot be a long-term player in the society," he said. "So, because of that, most big corporations or medium-size corporations have started taking part in corporate social responsibilities," Murthy said. In response to another question as to how Infosys is scoring on this, the legendary entrepreneur said that "At Infosys Foundation we contribute a certain amount of our profits each quarter and the foundation addresses the basic needs of the poorest of the poor people." 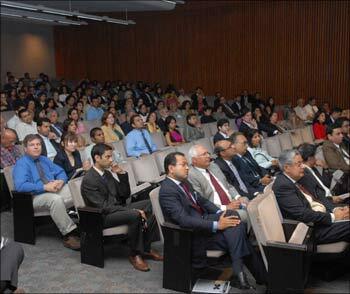 Image: A section of the audience at the AIF Annual Summit in New York on Monday. He said the foundation builds hospitals and libraries, has given scholarships to thousands of rural children, helps rehabilitate fallen women, and also builds hostels for the destitute. "So we have done and have been doing a little bit of work in helping the downtrodden in the society," he said. Asked for his views on sustainable development and the need to arrest climate change that came under focus at the United Nations last week, Murthy said that it is "simply important to understand that the humankind has got only one planet. "I am glad that the Copenhagen conference is coming and now there is more or less unanimous agreement that all of us have to focus on sustainable development for growth," he said. "That is where I think corporations have to be aware of the resources that they use, the kind of carbon emissions that they produce, the kind of energy they consume. We, at Infosys, have a green initiative and we have been focused on reducing the use of electricity, reducing the use of water and reducing the use of energy in various ways."